2019 Volvo XC60 Trim Levels with Comparisons & Configurations. What 2019 Volvo XC60 Trim Level Should you Buy? What is the Difference Between Trims? The Volvo XC60 is a mid-sized crossover vehicle that first debuted in 2018. Some major upgrades and improvements have been implemented for this year's model. It's now more powerful and more fuel efficient. The interior offers more space. It's also a lot more luxurious and stylish on the inside. This crossover is now better equipped with an impressive array of standard features. Volvo's XC60 provides plenty of room for passengers and cargo. You get 30.8 cubic-feet of space with all of the seats in use. With the seats folded down, this can be expanded to 67.4 cubic-feet of space. The XC60 is a reliable vehicle with good crash-test ratings and a lot of high-tech safety features. The XC60 is available in three major configurations and four different trim levels. The T5 and T6 models are based around different power trains. The T8 model is a plug-in hybrid. The four trim levels are branded as the Momentum, the R-Design, the Inscription and the Polestar Engineered. With so many models and trim levels available, it may be difficult deciding which version of the Volvo XC60 to choose. We will take a thorough look at each configuration and trim level that the XC60 has to offer. Each trim will be compared to the next and previous levels. Armed with this information, it should be easier to decide which model is right for you. Compare the 2019 Volvo XC60 T5 vs T6. What is the difference? When choosing a Volvo XC60, you'll first have to decide on the model. All models are four-door SUVs with a rear cargo hatch. All of them can seat up to five people. The T5 is equipped with a four-cylinder engine. The power of this engine is boosted by a turbocharger. This motor cranks out around 250 horsepower. You can get a T5 model in either front-wheel drive or all-wheel drive variations. It's available in every trim level except for the Polestar Engineered package. The T6 model starts out with the same 2.0-liter base engine. A supercharger is added on to greatly increase the engine power even further. This model is capable of producing 316 horsepower and 296 pounds-feet of torque. You get seriously improved acceleration and speed with this upgrade. This SUV will never feel sluggish even when it's loaded down with passengers and cargo. One of the nice things about the T6 is that it remains fuel efficient even with the engine upgrades. The T5 has a combined fuel-economy rating of 29 miles-per-gallon. The T6 is rated at 28 miles-per-gallon, so you don't lose anything for all of that added power. The T6 model is available in all four trim levels. You can choose from an all-wheel drive or front-wheel drive model. Both versions come equipped with a Geartronic eight-speed automatic-transmission system. Compare the 2019 XC60 Momentum vs R-Design Trims. What is the difference? The Momentum trim level is available in eight different colors. These are: Bright Silver Metallic, Crystal White Pearl, Denim Blue Metallic, Fusion Red Metallic, Ice White, Onyx Black, Osmium Gray and Pine Gray Metallic. The R-Design cuts the choices back to only seven colors. Denim Blue Metallic and Pine Gray are cut out. A new color called Bursting Blue Metallic is added on for the R-Design. Both trims share the same performance stats and features. The R-Design gives you paddle shifters to manually cycle through the gears if you need to. On the outside of the XC60, the Momentum gets you 18-inch wheels, aluminum roof rails and LED headlights. You also get a power-operated tailgate. The R-Design gives you the same features but with some upgraded, 19-inch tires and a redesigned front grille. Most of the remaining exterior features are the same for these two trim levels. Both models feature wipers with integrated washers. A rain sensor can trigger to engage the wipers automatically. The wipers are also heated to aid in removing thin ice or snow from your windshield. Both trim levels come with a laminated, panoramic moon-roof with a power sunshade feature. On the inside of the XC60, both models offer plenty of room, comfort and luxury appointments. Both trims offer dual-zone climate control. Both have a leather-wrapped steering wheel. The Momentum gives you Comfort Seat Padding while the R-Design comes with Sport Padding. The upholstery in the Momentum is leatherette while the R-Design gives you real leather. The driver's seat is power adjustable with a memory feature on both models. The R-Design adds on four-way power lumbar support. Both trim levels come with a Harman Kardon Premium Sound System. The infotainment system gives you Navigation, Volvo On Call and Smartphone Integration. Devices can be connected via USB port or Bluetooth technology. Voice commands allow you to control a number of features while your hands remain on the steering wheel. A color display gives you access to info for the infotainment system. A separate 12.3-inch display provides important driver information. Both trim levels offer the same safety features. You get a rear-view camera. The rear-view mirror has an auto-dimming feature. Both models have the same airbag system with bags up front for the driver and passenger. You get airbags for front and side protection. A Blind-spot Info System is included with Cross-Traffic Alert. Automatic Brakes are engaged after a collision and in various other scenarios. You also get a Lane-Keeping Assist and Oncoming Lane Mitigation. A Tire-Pressure Monitor is installed on both trims as well. In addition to the usual features, Volvo also implements a number of engineering and design features to increase safety. All versions of the XC60 come with Volvo's WHIPS™ Whiplash Protection System and head restraints. You also get the Side Impact Protection System or SIPS™ for short. Compare the XC60 R-Design vs Inscription Trim Levels. What is the difference? Once again, all of the performance features and specs are the same. These depend on the model you choose more than the trim level. The grille design for the Inscription is specific to the trim just like the R-Design gets its own grille. The wheels are still 19-inch models for the Inscriptions, but they're now black with a 10-spoke design. On the inside of the XC60, the Inscription trim upgrades the lighting. You now get ventilated front seats and a cooled glove-box compartment. The climate system is upgraded to a four-zone model instead of the dual-zone version installed on the previous trims. Most of the remaining interior features are the same for both of these trim levels. You get the same infotainment and audio systems as before. All of the safety and security features are identical for the R-Design and Inscription trim levels. 2019 Volvo XC60 Polestar Engineered. How is it different? The Polestar Engineered model is more of an optimization package than a specific trim level. This package is added to your Volvo XC60 by certified Volvo technicians at official dealerships. All standard warranties and service intervals are unaffected by adding this package. The upgrades are primarily made to the engine and power train of the vehicle. This is to increase the horsepower and torque for better overall performance. Upgrades are also made to the brakes, suspension, transmission system and steering dynamics. If you need the best performance available, this is a fantastic package to add on to your Volvo XC60. The T8 Plug-in Hybrid. How is it different? In addition to the two standard gasoline models, Volvo also offers a hybrid version of their XC60. This plug-in hybrid can produce an impressive 400 horsepower and 472 pounds-feet of torque. This mode is extremely quick with amazing acceleration for an SUV. In gasoline mode, it has comparable fuel efficiency with a combined fuel-economy rating of 29 miles-per-gallon. With the hybrid engine, you can save money at the gas pumps while remaining environmentally friendly. The hybrid is available in the Momentum, R-Design and Inscription trim levels. 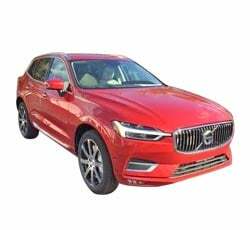 The 2019 Volvo XC60 is a fantastic choice for anyone looking to get a new mid-sized crossover SUV. You won't likely be disappointed if you choose any model or trim package. For those who want to go green, the hybrid is a fantastic choice. It also has incredible acceleration, horsepower and torque. It does, however, cost a bit extra over the T5 and T6 models. Between these three, the T6 is probably your best choice. You get the upgraded gasoline engine with better performance. Fuel economy remains almost the same as the weaker engine. It doesn't really cost much more either. Once you deice on the model, picking an all-wheel drive model should be a given. You get better traction and improved performance off-road and on slick pavement. It makes the Volvo XC60 a safer vehicle for all weather conditions. When it comes to trim levels, the R-Design is probably going to be the best value. You get all of the top safety and performance features in this trim level. The upgrade in comfort and convenience features is really minimal when you move up to the Inscription. The T6, all-wheel drive R-Design will be the best choice for the majority of drivers.